This stampless folded letter received a nice strike of an Antigua double circle handstamp. Antigua is one of the wonderful Caribbean Leeward Islands. It is east of Saint Christopher-Nevis and north of Guadeloupe. The Trans-Atlantic routing requested was Per Packet 10th Augt 1850.
until St. John's was made a branch office of the British G.P.O. in 1850." This letter seems sufficiently orderly to have been after the G.P.O. took charge. The destination was Wells in Somersetshire west of London and about 30 km south of Bristol. It appears that the 'Wells' was added after the cover had been addressed. Whether this was added by the sender or by someone along the way is a question. The letter was received in London with a red Crown WU CDS on September 2. There it was rated at 2/ and forwarded to Wells. The CDS indicates its receipt at Wells on September 2. The CDS includes the Somersetshire county designator. near Parham (the first capital of Antigua) on the northeast side of the island. The papers of the plantation business have been microfilmed. The papers are available in East Ardsley, England. THE TUDWAY OF WELLS ANTIGUAN ESTATE PAPERS, 1689-1907. East Ardsley: Microform Academic Publishers, 1999. 30 reels. (British records relating to America in microform). Note: Guide: A Brief Introduction to the Microfilm Edition of the Tudway of Wells Estate Papers, by Kenneth Morgan. SPEC-R HD8244.4 .M67 1999. The records included in this collection cover over three centuries of the operation of an Antiguan sugar plantation, providing the most complete surviving private records pertaining to these plantations. The plantation, called Parham and located on the eastern part of the island of Antigua in what was the British Caribbean, was owned by the Tudway family of Wells Somerset and was in operation by 1689, contributing to the sugar boom experienced by the island in the 1680s. The Tudway family, a prosperous middle-class¹ family, acted as absentee owners who rarely visited the plantation; thus, they did not witness the slave-labor source of their wealth. Records in these papers cover the years 1689 to 1920 and consist of a virtually complete set of annual accounts during those years, correspondence dating from 1717 to 1898 written from both Britain and Antigua, paylists, slave registers, and records of sugar cane experiments from 1905 to 1907. The records provide full details on all operating aspects of a sugar plantation as well as attitudes on absentee landlords and legislation affecting the sugar business and are valuable for reconstructing the social and economic history of the British Caribbean. 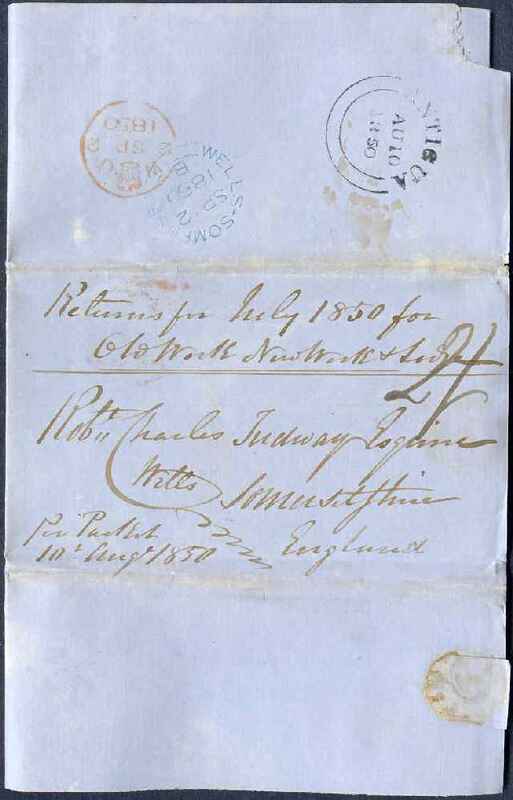 This cover was docketted as the Returns for July 1850 for various parts of the sugar plantation in Antigua. *Thanks to Richard Frajola for correcting the name of the addressee. are the two major sources of Antigua postal history. This hint led to the notes on the Parham Plantation. Ms. Gleadall is writing a history of Guiana Island. was acquired by Tudway and Turney in 1697.